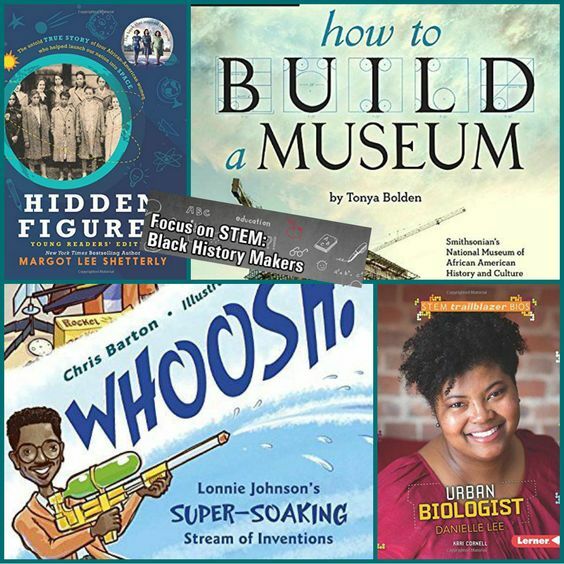 @Booklist_Briana made a Pinterest board for my February Booklist Quick Tips for Schools and Libraries column: Focus on STEM: Black History Makers. Lady Di of Ameter and Sir Cumference are visiting a fair with their friend the Earl of Fracton. In Fracton, you can buy a whole item or pieces of it. Lady Di spies a bolt of red fabric, but while she is getting a lesson on numerators and denominators from the seller, the fabric disappears. Meanwhile, Sir Cumference and the Earl are craving a snack so they chat up the cheese monger. He provides a lesson on equivalent fractions, which disappoints Sir Cumference because he, like an overeager second grader, thought choosing a large number for the denominator would guarantee more cheese. When the cheese monger turns to cut from the cheddar wheel, it’s missing too! In fact, all of the vendors are missing items. Momentarily flummoxed, the Earl decides to think like a thief which allows him to devise a fracton-like plan to catch the stealing stinkers. Through the medium of a puppet show, a reward of one valuable gold coin is offered to the customer that can find the largest fraction written on pieces of paper distributed throughout the fair. The Earl surmises that only a visitor to Fracton would be delighted with a low numerator and a high denominator. Sure enough, a motley crew leader boasts of having found 1/32 and is outwardly annoyed when his fraction is not declared the winner. Case closed. Fractions are one of the hardest topics for math students in grades 2-5. So when an engaging resource can be found to propel their learning, there is mathematical mirth to be had. The concepts are explained in an enlightening way both textually and visually. You also get the added bonus of fun wordplay, which is a hallmark of the Sir Cumference book series. All hail this new addition to a venerable math series! 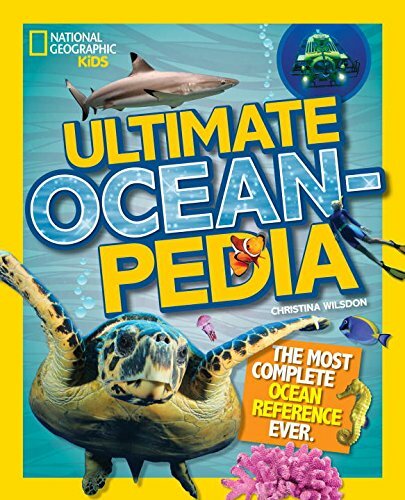 Booktalk: From tsunamis and sea turtles to riptides and reefs, learn all about the creatures, science, and ecology of our oceans, which cover more of the planet than all the continents and are just as important! Travel through all parts of the ocean to learn how it affects of our world, including storms and climate. Amazing facts, photos, illustrations, and diagrams are found throughout this book, along with conservation tips, weird-but-true facts, and a mini ocean atlas. Challenges to the health of our ocean and its creatures are also presented along with what people are doing to keep it pristine for generations to come. The Pacific Ocean is the largest ocean. It’s so big that it could hold all of the Earth’s continents, with room to spare. It contains nearly half of Earth’s ocean water. But the Pacific isn’t just the biggest ocean. It’s also the deepest. The average depth of the Pacific is about 14,040 feet (4,280 m)–more than 10 times the height of New York City’s Empire State Building. It’s also home to the deepest place on Earth: Challenger Deep, which sits in the Mariana Trench, a canyon on the ocean floor. Challenger Deep plunges 35,827 feet (11 km). The Astronaut Instruction Manual began as a book on Inkshares, basically a “Kickstarter” for self-published books. 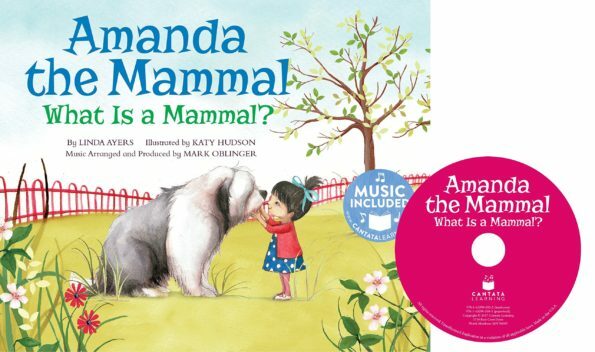 Largely do to its author’s subject knowledge and enthusiasm, it became a popular seller, hence the recent release of the audiobook version. According to the Hollywood Reporter, there is also a television series in the works. Mike Mongo narrates his own book with an infectious enthusiasm for guaranteed to draw you in to this practical and inspirational look at the future of space travel. My complete review of The Astronaut Instruction Manual may be found in AudioFile Magazine, in print and online at this link [http://www.audiofilemagazine.com/reviews/read/121233/the-astronaut-instruction-manual-by-mike-mongo/]. The Liuwa Plains are in Western Zambia – a perfect habitat for zebras, wildebeests, and lions. Back in 1972, the plains were declared a national park. But as the 20th century drew to a close, the plains were radically changed by war and poaching. 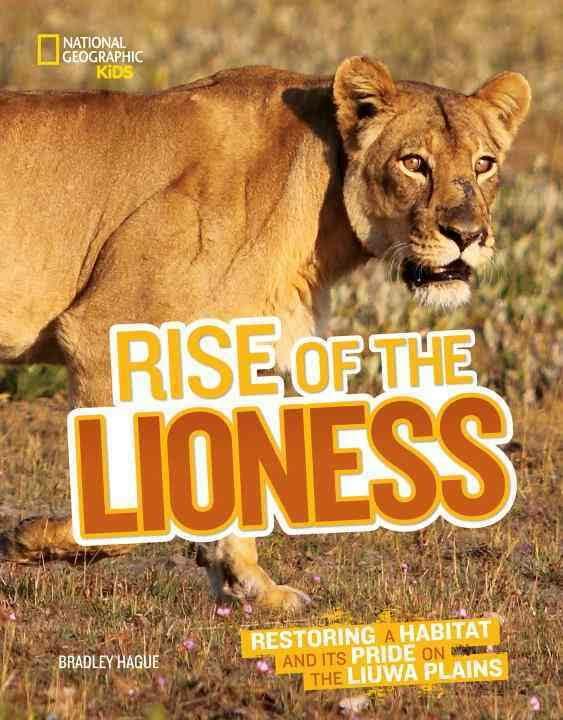 In less than a single human generation, Liuwa’s ecosystem collapsed and by 2003, when peace finally settled, there was only one lion left: a lioness called Lady. The thing about animals is that they don’t just live in their environments; they shape them, too. And the Liuwa Plains without its top predators was “the environmental equivalent of tearing down a dam or blowing up a road,” writes Hague. The loss of the lions created a trophic cascade, affecting the behavior of almost every animal in the habitat. This book follows the scientists who studied Lady and figured out how to rebuild the local ecosystem. That meant reintroducing animals, including lions – easier said than done. But after many years, the Liuwa ecosystem was restored. This is a story of perseverance, patience, and pride. Head over to Archimedes Notebook for another book focusing on predator-prey interactions. This was the forest where I lived with my family. We used to race through the undergrowth and rest under the great shade trees after playing all day. 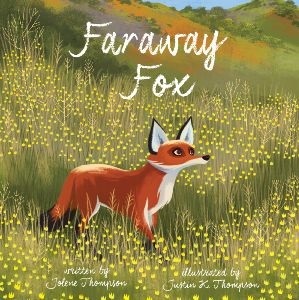 Faraway from his family, Fox wanders the same forest he grew up in. He remembers beautiful trees and streams. But the landscape he travels through is unfamiliar, filled with cars and houses, and paved over. What I like about this book is that is shows wildlife in an urban landscape. It also highlights the challenges a fox – or any other wild animal – faces when trying to return to their familiar habitat. This fox is lucky, because he won’t have to dodge cars while crossing a busy highway. Instead, people have engineered a better solution to help him get home. In an author’s note, Jolene Thompson discusses human encroachment into wild animal habitats, and some of the things people are doing to minimize the impacts. Wildlife crossings have been built under highways and over highways to ensure that animals aren’t cut off from the resources they need. She provides resources for people who want to learn more. Beyond-the-book activities over at Archimedes Notebook.